Giuseppe was from the old country. He himself was old. But he was reasonably well off, able to have provided nicely for his wife Roberta and his seven children Alberto, Bianca, Carlotta, Donato, Ernesto, and twins Francesca and Francesco. Giuseppe thought it was a good idea to stop at seven children because he realized there were 26 letters in the alphabet. Best to stop at F.
That many children in the house meant his days were filled with joy. Well, as much joy as possible after working ten to twelve hours in his workshop creating new colours that first his wife, then eventually a factory full of workers could use to dye the clothes they made for the family firm, Lululampone. Giuseppe was quite famous for both the soft pastel shades of pink, mauve and baby blue he had created and later, by contrast, when he had grown tired of that the bright shades for the younger set of neon pink, fluorescent green and shocking purple. One day a sports store company called Giuseppe and asked if he was a able to create a bright, bright orange colour that they wanted to use for all their hunting jackets and hats to sell in all their stores across the country. Never one to shy away from a challenge Giuseppe said he'd take a shot. Giuseppe always was one with the puns. 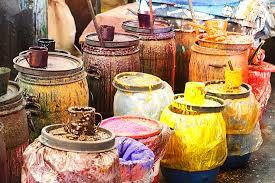 He soon set to work mixing his powders and paints to create a huge vat of brilliant orange. He started with a yellow base and slowly mixed increasing amounts of red until he got what he thought was the definitive shade of orange. But something happened between the time he mixed the colour and when he told his family what he had accomplished. When Giuseppe walked through the door that night his wife Roberta gasped and cried "Giuseppe, what-a happened? You're all-a orange!" Giuseppe looked sheepishly at his wife and amidst the laughter of his children told her "Well, everything went-a well up until I was almost finished when I-a tripped over a leg of the giant vat and tipped it over. I couldn't get outta the way and the dye caughta me." The prompt at Studio30+ is contrast/dichotomy this week. Giuseppe isn't the only one who enjoys a good pun.